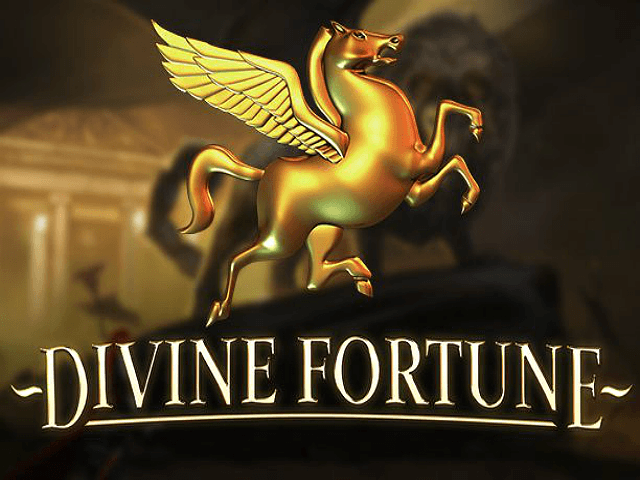 If you’re after a classy slot game via laptop and/or mobile, then look to NetEnt’s Divine Fortune – one of the most opulent games available in online casinos right now. Themed around ancient Greek mythology and set over a rich five reels and 20 paylines, it’s a game of beauty that includes jackpot bonus games and progressives. With a background soundtrack to match the sophisticated graphics and gameplay, this video slot has a high-end appeal for those who appreciate the finer things in life! 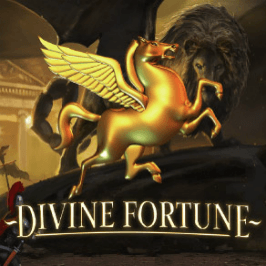 Play Divine Fortune Slot Demo for Free! Play Divine Fortune for Real Money! NetEnt is gaining quite a reputation for high-quality video slots and Divine Fortune only adds further kudos to its stable of stunning games. It definitely compares favourably to other slots based on the mythical world – featuring a Greek temple gamescape, flanked by two goddess statues (naturally, of divine proportions). The graphics are beautifully rendered, with ethereal sounds bringing in the symbols of Medusa, the Lion, the Minotaur, the Phoenix and Pegasus back to life, across 20 fixed paylines. Landing Pegasus on a spin turns things wild, while the lightning bolt acts as a scatter. The gold coin icon launches the bonus game where huge jackpots await those blessed by the gods. In addition to some of the smoothest slot tech on the market, this slot from NetEnt offers a nice 96.59% return-to-player ratio. Greek alphabet symbols pay out winning combos from 6x to 80x your spin size. 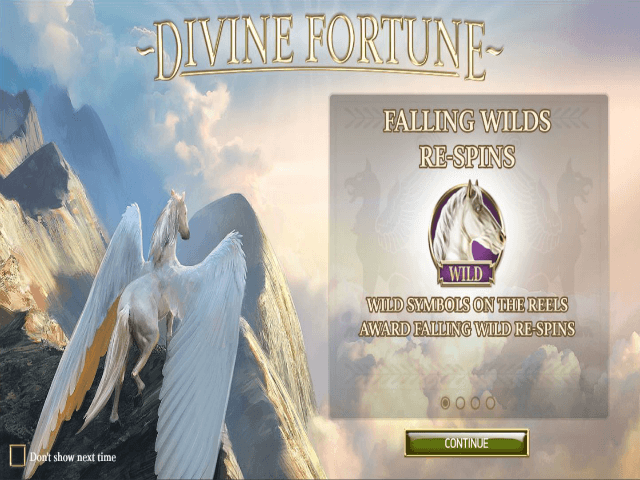 Divine Fortune features a classic wild in the shape of Pegasus, but it can do you more favours than merely completing winning combos. The winged beast is also your gateway to free-spin falling wilds; after regular wins have been paid, the icon shifts down one place on the reel and re-spins. Any existing or new wilds continue cascading down the reels with free spins until all the wilds have disappeared. As an extra bonus, the wild-on-wild feature is triggered when a wild icon lands on top of a falling wild, making Pegasus so excited that he rears up to expand down the whole reel to potentially deliver a juicy payout. The expanding wild then shifts down the reel one notch and rewards you with a falling wild free spin, with two falling wilds. Wilds matched during the free spins transform into wild-on-wilds to boost winning chances. 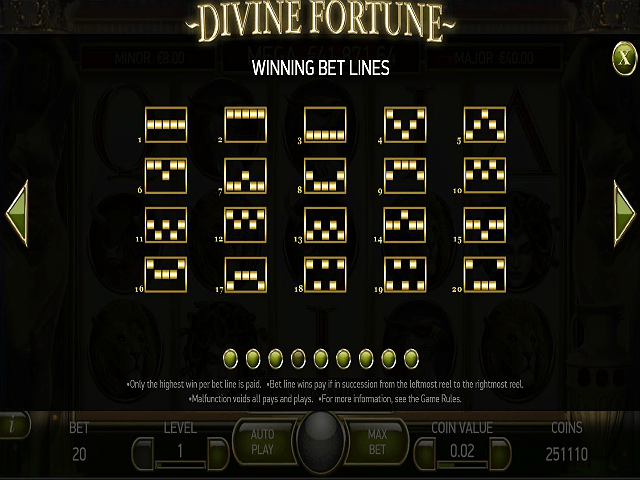 In short, NetEnt’s Divine Fortune slot is a game that impresses with its flawless graphics and touch-screen mobile playability! Share this Divine Fortune Review today! 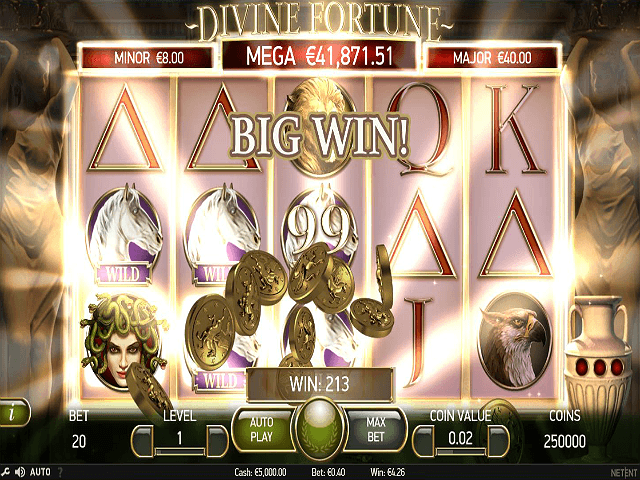 If you like Divine Fortune, you'll love these slot titles too!